The annual International Wedding Trend Report will be released at the start of engagement season and they’re eager to share your inspiration shoots with readers globally. 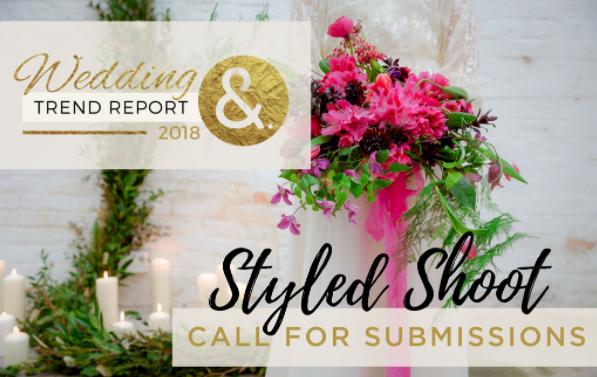 Each year a hand-selected group of stylized shoots are selected to complement the Report, which includes insight from top wedding professionals throughout the world. This year wedding editor Sara Burnett of Burnett’s Boards will serve as the judge. The winner will win a coveted spot on Sara’s editorial calendar with a feature dedicated to their shoot. So what are they looking for? In short, what’s going to be BIG in 2018. Think fresh and inspiring details that get you excited for next year. Please note that styled shoots can be previously published work.